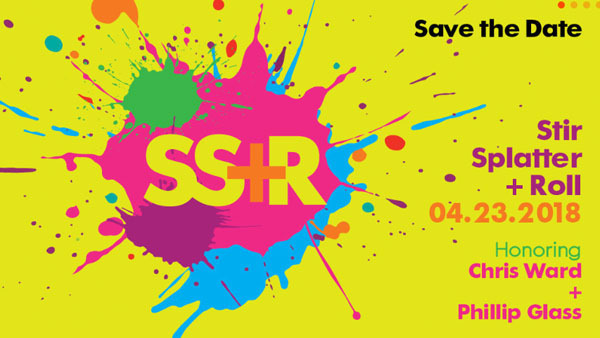 Publicolor’s annual Spring benefit “Stir Splatter + Roll” will be held on April 23, 2018 at the Metropolitan Pavilion, 125 West 18th Street. Beginning at 6:00PM, guests will enjoy colorful cocktails, painting alongside some of our city’s leading architects, artists and designers, and a festive gala dinner with a wonderful live auction. This year’s benefit will honor Chris Ward – AECOM VP and CEO, Metro New York, and former Executive Director of Port Authority – and present the boundary-breaking composer, Philip Glass, with the Catalyst for Change Award. Publicolor fights poverty by aggressively addressing the alarming dropout rate and low levels of educational attainment and youth employment in New York City. They do this by engaging high-risk students, ages 12-24, in a long-term continuum of intensive, multi-day, design-based programs to encourage academic achievement, community service, college preparation and job readiness. Their unique applied learning approach uses design and design thinking as vehicles to engage, stimulate and inspire at-risk, low-performing students in our city’s struggling middle and high schools, empowering them to achieve success in school, college, career and life. Prominent placement of two tables of 10. 2 Saturday community service opportunities for 20 corporate + community volunteers each day. Volunteers will paint alongside Publicolor students to transform an under- resourced school or community site. Logo + listing as Gold Leaf Sponsor on all event materials including invitations, e-blasts, event signage + virtual journal ad. Premier placement of one table of 10. 1 Saturday community service opportunity for 20 corporate + community volunteers. Volunteers will paint alongside Publicolor students to transform an under-resourced school or community site. Logo + listing as Full Spectrum Sponsor on all event materials including invitations, e-blasts, event signage + virtual journal ad. Premier placement of one table of 10. Logo + listing as High Gloss Sponsor on all event materials including invitations, e-blasts, event signage + virtual journal ad. Premium placement of one table of 10. Listing as Semi-Gloss Sponsor on all event materials including invitations, e-blasts, event signage + virtual journal ad. Premium placement of one table of 10. Listing as Satin Sponsor on all event materials including invitations, e-blasts, event signage + virtual journal ad.